I wanted to make a terrarium from an old fish bowl, but couldn't find inexpensive, small leafed plants. I realized that my herbs growing outside would not only look great, but I could keep and use them all winter if I planted them in the bowl. I planted oregano and common thyme and added a little toy crab. I love it! 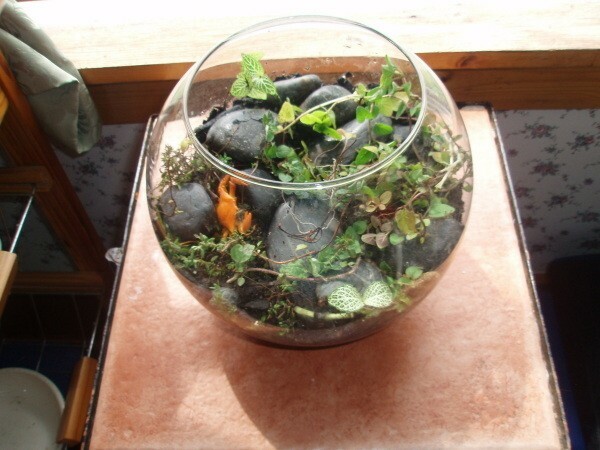 Just add some pebbles for drainage, then soil, then plant some herbs into your terrarium. Add some pretty rocks, shells or small toy and enjoy your fresh herbs in your indoor garden all winter long.